Departure by ferry-boat via Yalova, enjoying the lovely countryside view. 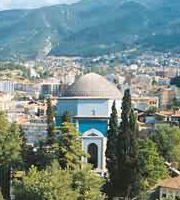 Drive to Bursa, former Ottoman Capital and lunch of famous "Kebap of Alexander The Great". Climb to Uludag, the legendary Mount Olympos, by Teleferik (Cable Car), visit to Ulucami (Grand Mosque), the Green Mosque and the Green Mausoleum, the old Silk Market in the Covered Bazaar.